The River is another essential Blu-ray release of a Technicolor classic from the Criterion Collection. Although Jean Renoir’s The River doesn’t feature Bengal tigers or elephants, it rather unthinkingly proffers the cold hand of colonialism as it intrudes upon the warm terrain of the Ganges River in India, sometime following WWII. The war itself is never explicitly referenced, but the appearance of Captain John (Thomas E. Breen), whose leg was lost in “the war,” is a formidable reminder of postwar consequence as it pertains to the bodily self. John is the film’s driving force since he comes between a pair of white teenage girls, each of whom subsequently vie for his affections. These narrative developments would be thoroughly contemptible were Renoir not equally engaged with giving visual texture and meaning to the Indian landscape, in a manner that successively suggests it as less an interchangeable backdrop than a distinguishing characteristic of this particular story of “true love,” as it’s referred in the opening scene. 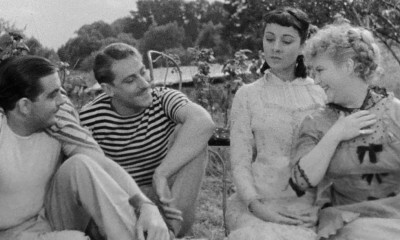 That romance involves young Harriet (Patricia Walters) competing with the older Valerie (Adrienne Corri) not just for John, but the right to be addressed as a woman, something the script by Renoir and novelist Rumer Godden examines with commendable rigor by having the two also be contrasted with Melanie (Radha), a twentysomething woman of multiple ethnicities. Outwardly, The River presents a sumptuous, almost impossibly beautiful lensing of various spots within the region, made more impressive given that the entirety of the film was shot on location in India rather than a studio, unlike previous Godden adaptation Black Narcissus. However, Renoir takes minimal narrative advantage of this. Opening images of the Ganges reveal natives toiling around its expansive reach with little notice or attention paid beyond a survey of the landscape. The film utilizes a hindsight narration from an adult Harriet, now a writer, recanting the tale with mythological aplomb and commencing with a questionable metaphor about how the film’s love story has a “different flavor” simply because it’s set in India. Minutes later, narrator Harriet brags that “living in India gave [my family] a special flavor.” Harriet asserts that simply by living in proximity of cultural others or, perhaps put another way, that by living in exile of one’s ethnic origins, a quality is gleaned from the exchange that distinguishes or refines cultural knowledge. As the lines are spoken, Harriet misunderstands exploitation for privilege, evoking colonialist delusion while perpetuating cosmopolitan myth. In other words, if Harriet is understood to function as a mouthpiece for the filmmakers, then the ideology being offered is rather firmly dominant and hegemonic. Given the film’s continued focus on these romantic entanglements, which veer into melodramatic conceptions of Freudian selves quite frequently, Renoir does little to suggest Harriet as an unreliable narrator. Even questions of difference are largely filtered through Capt. John as he explains his outsider status to Melanie, each of them acknowledging a displacement from a singular culture. 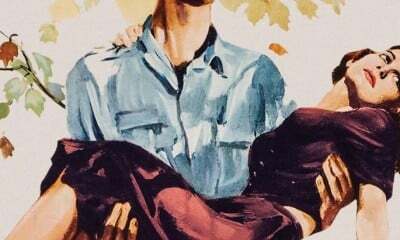 Douglas Sirk’s Imitation of Life makes the interactions here seem naïve and unconvincing by comparison, in terms of complexly addressing mixed-race relations. Aside from Melanie, Nan (Suprova Mukerjee) and Ram Singh (Bhogwan Singh) are the only two Indian characters that receive any extensive detailing, and it’s exclusively as supplements to the English family’s wellbeing. Renoir’s relegating of Indian characters to marginal figures speaks for itself, but it also calls into question Harriet’s early claim for India’s significance in the film, which begins to appear less culturally specific than initially promised and progressively confirms the filmmakers’ ideological overlaps with the narrator. In effect, Renoir humanizes India, but does so with ethnographic curiosity by relying too heavily on its cultural specificities for mere visual detail, instead of affording a multitude of perspectives. Although the film’s titular river is expressed as being complicated and polymorphous, the narrative remains restricted to an unquestionably limited valence, in which even Indian physical expression via a prolonged dance sequence is rendered through fantasy and myth, as Melanie explains the story of Prince Krishna and Radha. 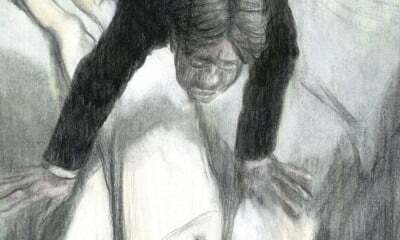 Moreover, the death of the family’s youngest child from the snap of a cobra could be more emphasized for its stark reminder of dire consequences made real through the inattentions of cultural appropriation, but The River opts for a more insular tragedy instead, viewing it as merely a moment for familial grieving. For all of the film’s dizzying visual prowess, its socio-cultural politics are fairly dulled. In defeating a mindset that saw India as only useful for an adventure film embroidered with high Romance, Renoir enacts a small victory of content reversal, which nevertheless remains enthralled with colonial tales that posture as progressive by proxy of an inclusive exclusion, which allows depictions of the colonized, but remains insistent that they be categorically kept at arm’s length. If the transfer on the Criterion Collection’s 2005 DVD was already superb, this new Blu-ray presentation of The River only intensifies those strengths. Depth, color, and clarity are all tightened and bolstered by the high-definition format. Color balance is fluid throughout, with only minor deviations, which one suspects could be a facet of the film’s original Technicolor negative, which means Criterion has thankfully avoided digital enhancements. There are no imperfections to the image throughout. The monaural soundtrack is clear and crisp, with dialogue and music balanced to complement one another. Like the image, there are no imperfections or noticeable deficiencies. The new lot of supplements is stronger than on the previous DVD, though it comes at the expense of the documentary “Rumer Godden: An Indian Affair,” which has been eliminated from the Blu-ray. In its place are “Around the River,” a one-hour documentary about the making of The River and “Jean Renoir: A Passage Through India,” a video essay that explains the film’s titular river as a metaphor for continuity and the cyclical nature of life and history, relating this narrative to Renoir’s own life around the time of production. Both are essential additions to deepening an understanding of the film’s complex aesthetic aims. An introduction by Renoir also helps in this regard, as the ever-terse director explains, in under 10 minutes, precisely how he came to make the film. Martin Scorsese gives an interview that reveals his adoration for the film, which began when he first saw it as a nine-year-old boy in New York City. Scorsese considers the film perhaps Renoir’s best and calls it, along with The Red Shoes, the most gorgeous-looking color film ever made. A lengthy audio interview with producer Ken McEldowney helps further flesh out the film’s production, while an essay by Ian Christie evaluates the film’s complex understanding of colonial rule and Indian independence. A trailer is also included, along with brief notes on the film by Renoir.